It was Christmas and the small market town of Marlborough and the surrounding landscape of fine farming land took on a Christmas card appearance under the snow and frost of the winter of 1947. Snow fell almost daily and the frost each night kept the snow crisp and deep for several weeks. Just off the wide High Street stood a brightly painted building of cream and turquoise that housed a unique showroom bringing a special kind of magic to the old English town. 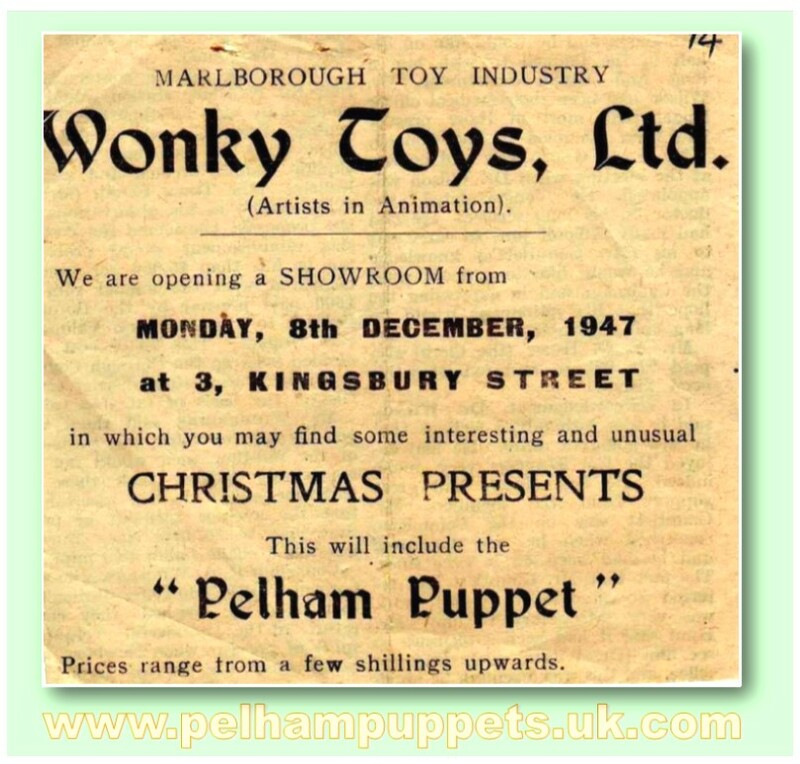 The building was Victoria House, the original home of Wonky Toys later to become Pelham Puppets. During the first year of production the only outlet for sales consisted of a window display and shop in the front of his rented premises. As the Christmas season drew near, daily demonstrations were staged in the window much to the delight of passers by. Bob advertised in the local press and this advertisement appeared in the Marlborough Times on 5th December 1947. For centuries puppets have brought delight to people of all nationalities. If they had maintained such popular appeal over many generations, why not, thought Bob, make string puppets available to children? With no previous experience with puppets he enlisted the help of Jan Bussell and Ann Hogarth who lived across the street from where he had his workshop, seeking some help and professional advice in the design and construction of string puppets. Jan had been a long standing friend and together, with his wife Ann Hogarth became puppeteers of world renown staging professional performances all over the world. Jan Bussell was only too happy to assist and recalled how Bob approached him with the idea of manufacturing puppets before starting the factory and he worked out details of the simplest form of control and stringing with him. “Jan gave encouragement and advice at a time when it was most needed,” Bob once remarked, and he found it gratifying to feel, “that so much fun was being given to so many by something which, at one time was considered unsaleable.” More details about How It All Began here. Throughout the 1950’s the steady progressive success of the company contributed greatly to the spirit of enthusiasm within the factory. Bob put forth continual efforts over the years to promote and maintain a happy spirit among his employees and he was always proud of the fact that he knew each one by name. It was easy to see the truthfulness of that for if it hadn’t been for the fact that the majority of employees were women, it would have been difficult to point him out. Every day one could find him busy at a bench in a dust covered apron among them all! The company did branch out from regular lines of production by undertaking special work for the professional stage for many years. 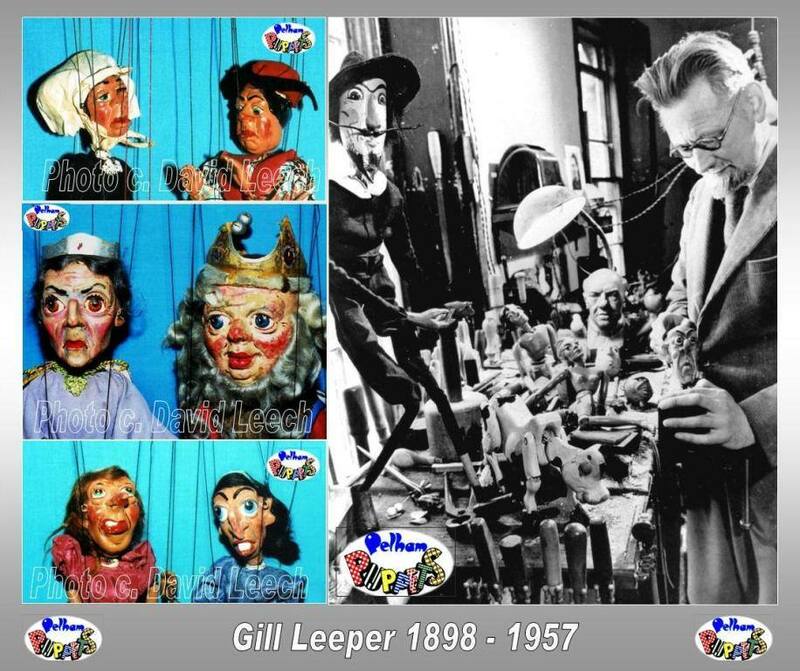 This is where Gil Leeper played a major part in the design and development of Pelham Puppets. Gil Leeper lived in an apartment on the top floor of Victoria House (where Bob Pelham occupied the ground and first floors for puppet production,) and he soon became familiar with the work that was going on in the floors below. He was a master wood carver and design artist. 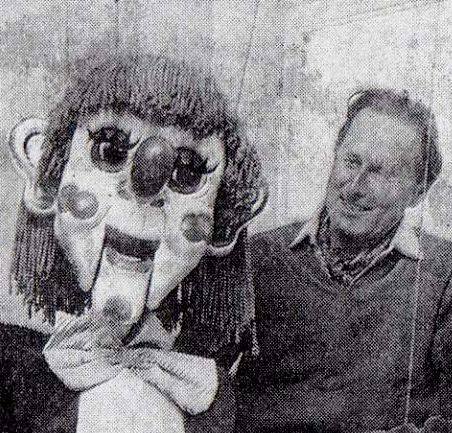 He first became involved with Pelham puppets when he offered to train the face painters to refine their work and helped to establish the traditional “Pelham look” to the faces of Pelham Puppets. Later he was responsible for producing, with infinite care, some of the heads for the Type SL some characters from the original Cinderella series and Alice in wonderland characters as well as larger, professional puppets for use in theatre, film and television. His designs and work is very distinctive and is easily recognised by the caricatured, exaggerated and pronounced features, such as shown in the accompanied photographs of the two Ugly sisters and characters from “Old King Coke” – that were commissioned for the production of an advertising film for British Gas Board. Sadly, on 12 July 1957 Gil was killed in a road accident on his moped when he was involved with a collision with a car near Marlborough. As with any company history, Pelham did not escape some serious setbacks. One major set-ack occurred in October 1961. 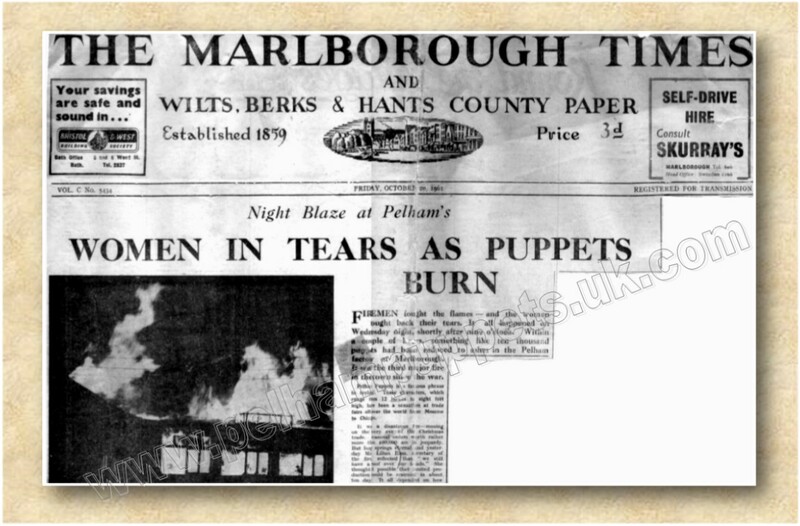 “Women in Tears as Puppets Burn” reported the Marlborough Times. “Firemen fought the flames and women fought back the tears.” On the evening of October 19th something like ten thousand puppets had been reduced to ashes. Most of the buildings, including the stock room, had been completely destroyed. About the only place that remained intact were the factory offices in which were all the production records and files. It was therefore possible to pick up the threads of business, contact customers and try and obtain new, raw materials from the suppliers as quickly as possible. “It’s amazing,” recalled Bob, “to think that we moved everybody into six small store sheds and continued with production.” He was more than ready to recall the loyalty and good work of all his employees, “There was a good spirit throughout,” he was reported as saying in the Marlborough Times the following week. Although conjecture was rife for a time and everyone had their own pet theory, the actual cause was never established. That it started in the paint room was beyond doubt, but why, remains a mystery to this day. A short time later plans for a new single story factory had been drawn up and building work was well under way by the following year. It was an exciting period in the life of the company with a whole new range of puppets and a steady upward trend in sales both in the UK and abroad, especially America. In 1963, over 226, 200 puppets were produced making it a record year for the number of puppets made and included a whole new range of characters designed by Peter Carter-Page. He was a respected Canadian artist who had previously worked for the Walt Disney Studios although it is not certain when this was so. He had been living in Toronto, Canada, before coming to England and obtained work making puppets for Jan Bussell and later began to work for Bob Pelham. It is not certain exactly when this was, but he did work at the same time as Gil Leeper but they had very different ideas and methods of working. It appears they did not collaborate in any way and more often than not, worked in separate areas of the factory. The range of characters continued to increase, partly due to television programmes featuring puppets. Through the medium of television they became loved and wanted by increasing numbers of children. Where the aerials went up so did the sales. Once the production rights were obtained to produce certain characters, Pelham was almost certain of success. Pictured below are some of the TV characters that went into production in the early 1960s. Below: (Left to right) Tex Tucker; Mike Mercury; Steve Zodiac and Venus. Below: (Left to right) Pinky & Perky; Huckleberry Hound & Yogi Bear; Dougal; Ermintrude; Florence. By the late 1960s Bob wanted to see a greater interest in puppetry from older children and grown ups and came up with a new range of puppets in 1968 that were designed to encourage older age groups to become involved. Within the first year, a range of seven characters, comprising of Supy, the boy with long black, sheepskin hair, Cornelia with large moving eyes and lashes, Boggles, a girl with blonde/yellow sheepskin hair, a Monk with halo attached, Katie the caterpillar also with large eyes and lashes and finally, Walter wearing the deer-stalker hat and Fido the singing doggy. A couple of years later, legs were added to these puppets and this, in turn led to the production of 24 inch tall string puppets in the late 70s. The upward trend continued into the 1970’s with about one hundred thousand puppets finding their way each year, to the United Sates alone. By 1977, with the workforce approaching two hundred employees and nearly one hundred home workers, Pelham Puppets had become the largest single employer in the town of Marlborough. Although the 1970’s were exciting years, they also brought problems that seemed overwhelming to Bob at times and in 1973, he even expressed the thought of selling the business. He probably wasn’t serious but it was an indication of his feelings about that time. He had never had a long term strategy and while he had successfully and steadily expanded production over the years, with his haphazard sort of management, by the late 1970’s the world was moving into an economic recession and everywhere manufacturing industries in particular, began to feel the draught. As inflation continued to rise so demand declined and Bob found himself with a deteriorating cash-flow position and stocks started to mount and he became increasingly worried. By May 1980, after discussing the deteriorating situation with his accountants and financial advisers, Bob realised he was going to have to say ‘goodbye’ to many old and loyal friends. On May 21st he gathered the entire workforce together to explain the situation and the steps that had to be taken to ensure the continuation of the business. Thirty people were to lose their jobs but there was no alternative. Through it all, the life size Bimbo had stood in the factory reception, always ready to greet visitors with his eternal, baby-face smile. It was suggested to Bob that Bimbo should be treated to a new set of clothes and a face lift. Bob agreed and Bimbo was dismantled, renovated and re-dressed and painted. Within a day or two, Bimbo looking very smart and refreshed was returned to his position in the reception. But Bob was not entirely happy with him. He felt Bimbo’s hair was too long. So, on the close of the working day, on Thursday 19th June, Bob took a pair of scissors and a small cardboard box and gave Bimbo a haircut! Later that evening, Bob Pelham died suddenly at his home from a heart attack. He was sixty one years old. Though ‘PELPOP’ was gone the puppets remained, no less alive than they had ever been. A couple of years later, in 1982 Anne Pelham put the position clearly before all her agents and exhorted them to find new customers and to encourage the old ones. They took up the challenge and went out to see what they could do. However in spite of the Director’s efforts to keep the company going, they issued a statement to the local press explaining that the company was producing more puppets than they were selling and from August over sixty of the remaining employees were to be made redundant. In addition, the land and factory buildings north of the River Kennet were to be disposed of either by letting or selling. The company struggled on for another four years but in January 1986, Anne Pelham announced that she was calling in administrators to wind up the business and sell the company. On April 4th 1986 production ceased at the London Road factory and forty years of Pelham Puppets came to an abrupt end. 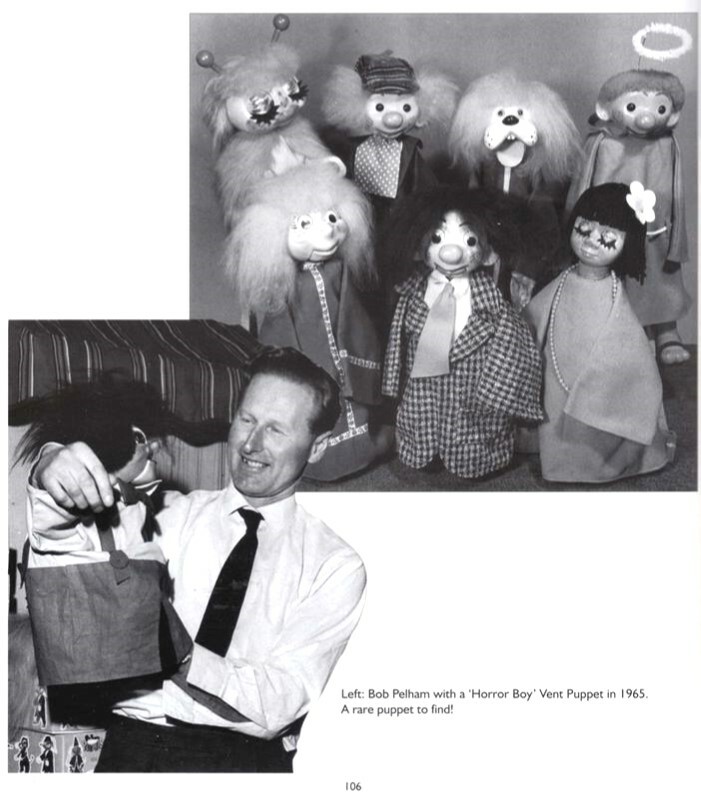 When one considers the demand for his puppets and their popularity today, seventy years later, Bob Pelham – PELPOP – will always be remembered as the man who gave the puppet to children. 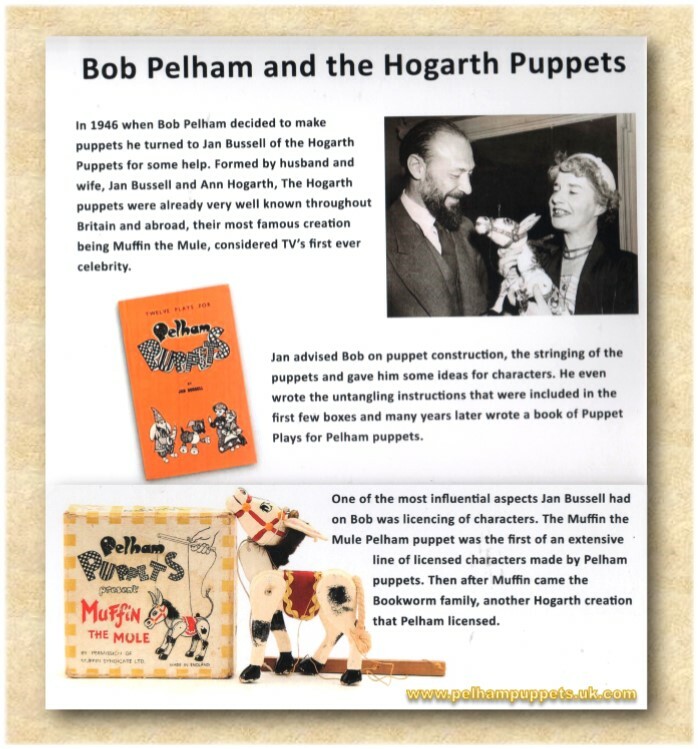 This is only a very brief summery about the history and development of the Pelham Puppets Company. 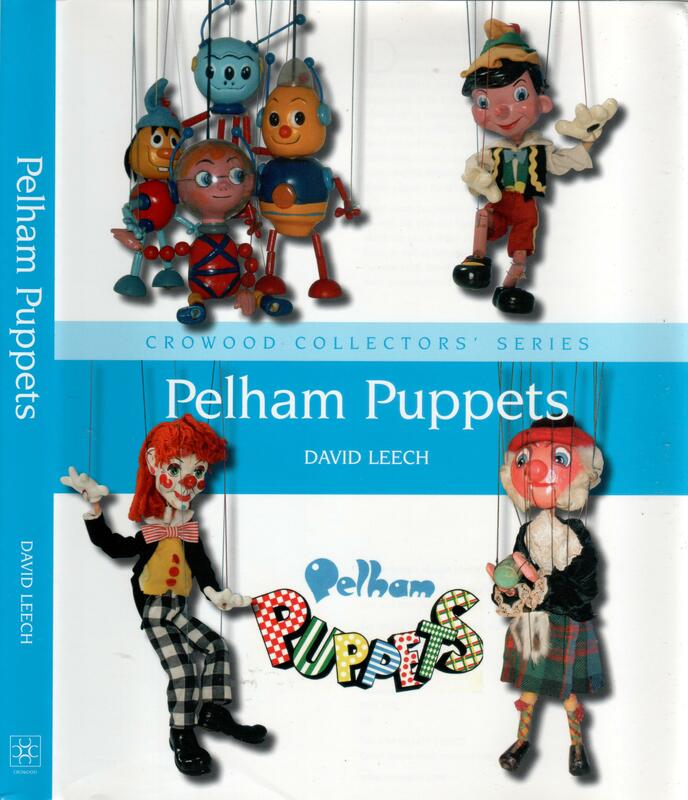 The full account, “PELPOP – The Story of Pelham Puppets” can be found in David’s book: PELHAM PUPPETS – A Collector’s Guide – published by Crowood Press (2008) IBSN 978-1-84797-055-8 and can be obtained from good booksellers, Ebay, Amazon etc. 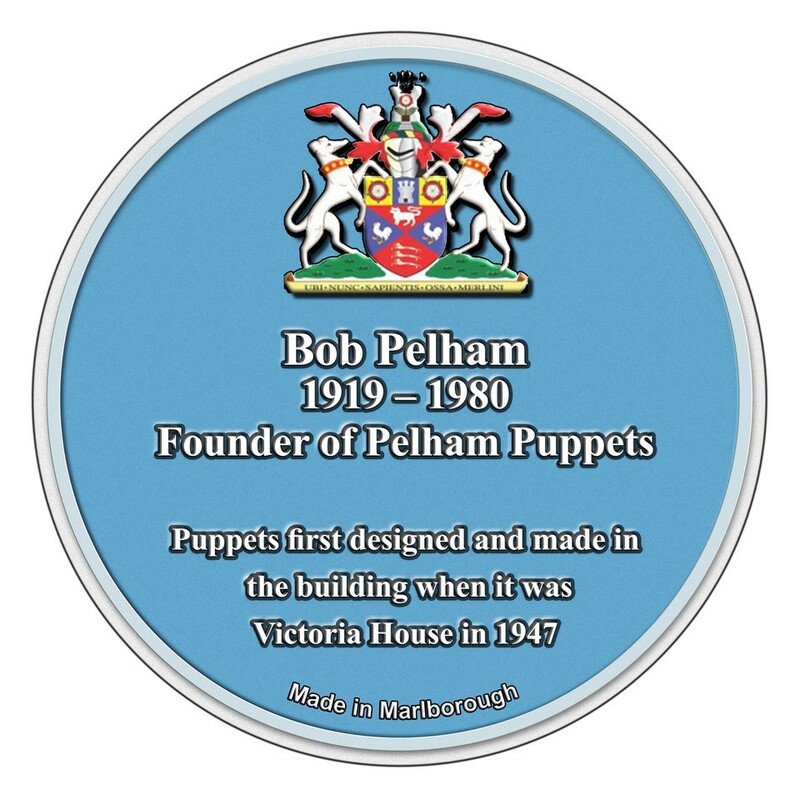 Following the 70th Anniversary Puppet Festival in 2017, Marlborough Town Council agreed to start the process of having a Blue Plaque made and placed on the wall of Victoria House where Pelham Puppets began – in recognition for all he did for the world of Puppetry and for the town of Marlborough. Updates will be announced on our Face Book page and here on the website over the coming months. 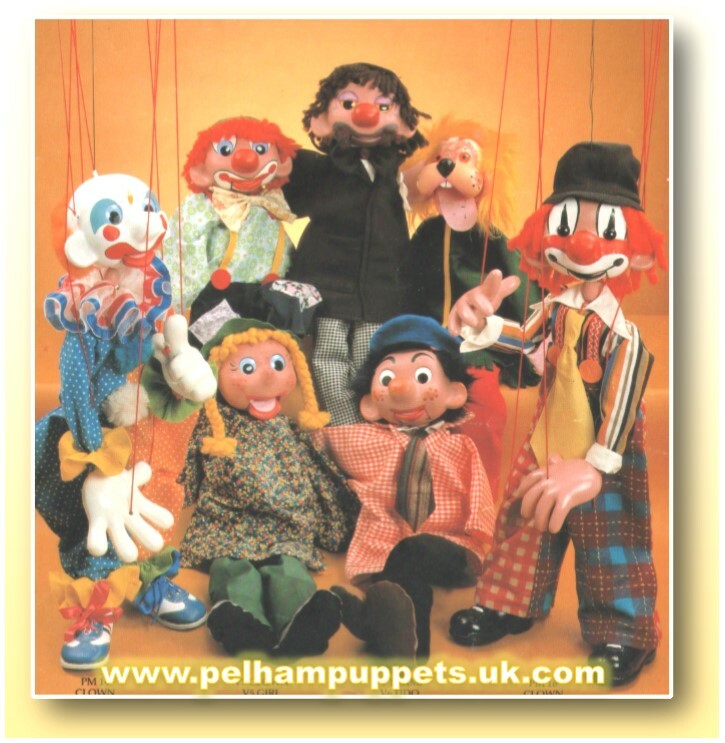 Between 1986 and 1993 Pelham Puppets changed hands several times with other hopeful toy manufacturers trying to re-introduce Pelham Puppets to the market. 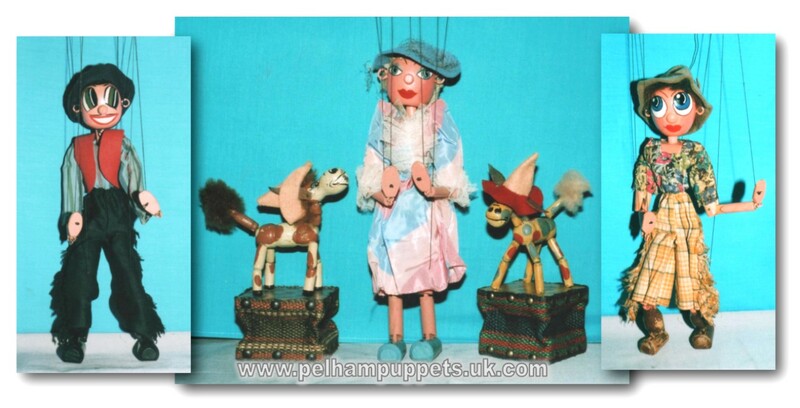 Since the early 90s, the puppets have not been available in toy shops, although David Leech launched a new range of Pelham Puppets in 2008 and currently, a further additional range of puppet characters can now be obtained from the SHOP page of this website.